Over the past few years, the people of Sacramento have become familiar with the existence of a recording featuring their town, thanks to YouTube. In 2010, Ken and Sally were invited down to the CBS Studios in London to do a Transatlantic Satellite interview and performance of “Sacramento, a Wonderful Town.” for their programme “Good Day Sacramento”. 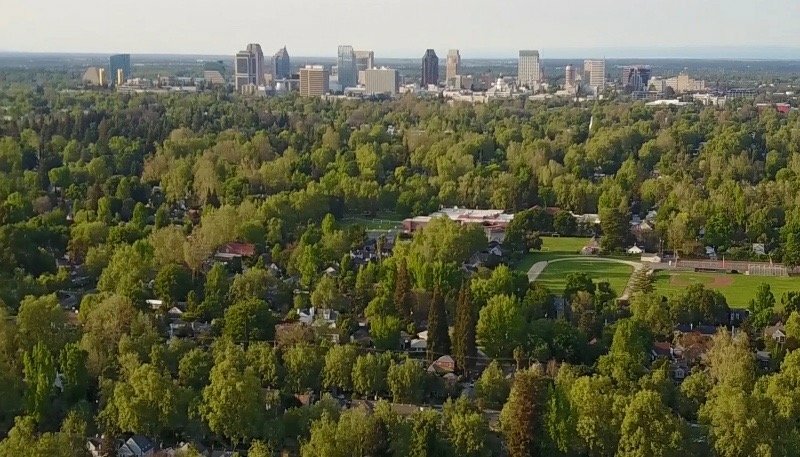 In 2018, in a collaboration with Westyroamer Films, Middle of the Road’s recording of the song was featured in a new documentary telling the story of the success of Sacramento’s unique urban forest project. Sacramento has a pretty hot climate and in an effort to reduce the amount of electricity used to power air conditioning units, the Sacramento Tree Foundation embarked on a tree planting exercise to create more shade in the city. This documentary will help to promote more tree planting in the future and Middle of the Road are happy to be a part of it. This has never been more true for our overheating world today. Quite apart from the natural ecological advantage trees provide, they are absolutely beautiful and this film illustrates this so well. Entitled “Made in the Shade” the film premièred in Sacramento last April and was featured on the Sacramento PBS Channel in January 2019. Ken and Sally were invited across to attend as VIP guests.